Berkley Walker at the Institute for Genomic Biology, needed a low fidelity solution for elemental analysis, instead of a high fidelity and high cost off the shelf model. Our Guru, Brian, customized the tolerances on some parts on thingiverse and helped build a custom DIY solution, which saved them a lot of money. "With help from the Illinois makerlab we were able to print the necessary parts for an X-Y positioning table to help prepare samples for elemental analysis. 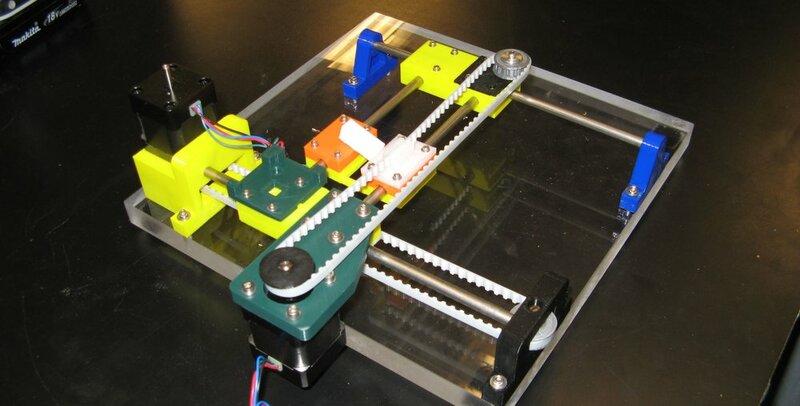 These printed parts are being combined with a pulley system and stepper motors to ultimately create an Arduino-controlled positioning system. There are similar systems available commercially, but they cost upwards of $7K and are much more accurate then we need for our application. This system has cost us close to $500 dollars, and that includes the fantastic design services of the guru, Brian Busch. Ryan was also tremendously helpful"